There are 400 billion stars in the Milky Way and 5.25 trillion pieces of plastic in our oceans–13 times more. An important action we can take is to clean up our beaches before the marine debris, which is mostly plastic, gets into or returns to the ocean. And we can also try to discover exactly where all this manmade plastic is coming from and do something about it. How? 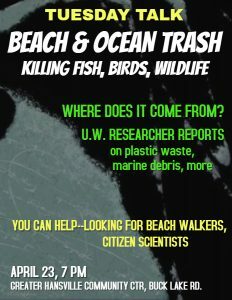 By becoming a citizen scientist with the University of Washington’s Coasst project. Coasst trains coastal residents on how to conduct monthly surveys on a beach that has special meaning to them. Volunteers collect data and report their findings to Coasst scientists, who then try to determine the source of the trash and put an end to it. And while beach walking, volunteers can help clean up their favorite beach. Hillary Burgess, Science Coordinator at Coasst, will explain how the plastic pollution of our waters has become such an environmental crisis. And you’ll discover how you can make a difference.